Tom and I scan the ocean beyond the palm trees wrapped up to look like Christmas trees. “Oh, there’s a light coming closer,” I say. “See?” I point to it and Tom squints at the light. “Wait…is that Santa Claus? On a longtail boat?” he bursts out laughing. “Oh my gosh, it is!” I join in the laughter as the boat docks on the sand and a clumsily clad Thai man in an ill-fitting Santa suit jumps out. I dissolve into a fit of giggles – not for the first time this night – and am joined by the table of college-aged boys next to us. It was the end of a Christmas Eve dinner at our Ko Phi Phi resort and multiple glasses of wine combined with the oddest Christmas celebration either of us had ever witnessed had Tom and I biting our cheeks through most of the night as to not be respectful. But the thing was – we loved it! We heard about the dinner when we checked in that afternoon. We didn’t have anything really planned for Christmas so figured why not. The buffet menu promised lots of authentic Thai food and seafood plus entertainment. We showed up to the beach of the resort that night for the Christmas Eve dinner, which had been set up with about 30 tables and a stage at the far end. We filled our plates with a variety of food and settled in for the show. Most people living in Thailand do not celebrate Christmas as the majority of Thais are Buddhist. Bless their hearts for trying to make all the Western tourists visiting their island feel at home, but as Tom commented halfway into the show with a laugh, “I don’t think this is what God had in mind for how Jesus’ birth should be celebrated. The show started with the MCs introducing themselves. Two pretty and giggling Thai girls who couldn’t have been much older than 18 or 19 and a middle-aged Thai man who was the hotel manager. They introduced the cabaret show, and for the next 45 minutes we watched lady boys perform Celine Dion, Whitney Houston, and other top 40 hits with their backup dancers who were never in synch. It was perhaps the worst performance I’ve ever seen – and it was totally fantastic. Next came the fire dancers – oh yes, fire dancers! They whirled and flung their fiery sticks around their bodies and into the air and it was actually quite good…except we couldn’t see them very well from our table. For whatever reason they were performing on the sand instead of the stage. “Maybe the hotel management doesn’t trust their skills and are worried they’ll burn their stage down,” I commented. After the fire tossers, there was a magician. I laughed and kept laughing through the magician’s task. He was some expat who could not perform magic tricks! Every trick he did, it was totally obviously how the trick happened. Magic? Not so much. Entertaining? Very much so, at least for Tom and I who couldn’t believe this Christmas celebration we had the honor of witnessing. It wasn’t all entertainment, though. Oh, no! This holiday party had games. Tom even won one for having a birthmark. Yup, a birthmark. It was during the “Show it to me” game. The MC girls had already gone through a striped shirt, a dollar bill, and a few other random things that just seemed to be called out for whatever popped into their heads. “And next, what should we do next,” MC Girl 1 squealed into the microphone. “I don’t know, but Merry Christmas!” MC Girl 2 responded in an equally excited squeal. The MC’s job seemed to be to find a way to fit in Merry Christmas whenever possible. “A what?” I whispered to Tom. He shrugged. No one else seemed to understand either as everyone is staring at her blankly. Tom suddenly pushes back his chair. “She’s saying birthmark! I have one!” He runs up and shows his birthmark on his arm. “A birdmark! On his arm!” MC Girl 1 happily announces to the crowd. “Oooohhhhh! Yayyyyyyyyy!” MC Girl 2 is way excited about Tom’s arm. He comes back to the table brandishing his prize of four Chang beers. This was how much of the MC-ing went, a lot of squealing and the predominately English-speaking audience straining to understand all the words coming out of their mouths. I had to appreciate their level of excitement that was put on for tourists for a holiday that they themselves probably didn’t celebrate. The next game called for couples. “We need couple with clothes!” MC Girl 1 announced. The pair came down to the sand from the stage and continued their urge for couples. Tom and looked down at ourselves. I’m wearing a dress and he’s wearing shorts and a t-shirt – not what you would call lots of clothes. “I think we should opt out of this one,” Tom said. We learned once they’d amassed five couples who were now standing in front of the stage. “Now take your clothes off and make a rope!” MC Girl 2 demanded. “What?” Tom said with a half laugh, half sputter as he nearly spit out his wine. “Take off your clothes and see who has longest!” MC Girl 2 commanded again. The couples still looked completely confused and weren’t making any motion to start disrobing, but then the couple on the end who had a cardigan and sweatshirt on shrugged out of them and held them in front of them in confusion. “Yesssssss!” MC Girl 2 shrieked happily. She and MC Girl 1 ran over to the couple’s side and flanked them on either side. “Now make rope!” MC Girl 1 said excitedly. The couple gave each other a confused stare and started laughing. They, like the rest of us were a bit confused what this rope business was all about. Luckily, the MC Girls jumped into help. MC Girl 1 handed her microphone to MC Girl 2 and then tied one of the sleeves from each clothing article together and then laid it on the sand before taking her microphone back. “Yayyyyyyyy!” MC Girl 2 chimed in. And the game was on. In a couple short minutes those of us in the audience were staring at 5 nearly naked couples and everyone was in stitches laughing. It was close, but one couple took off his watch to narrowly win the prize – which was a dinner for two in town. At least they weren’t getting naked for beers. And then when all the games and entertainment were done….Santa. “Santa” pulls up his pants which appear to be falling off him and picks up a bag from his boat before getting out. He begins making the rounds at the tables, with the male MC yelling into the microphone so excitedly about this turn of events, you’d think Brad Pitt had just arrived on the beach. Santa reaches our table and doesn’t look too merry. He looks tired – and hot. He hands us our little bag of goodies and says a “Merry Christmas” which seemed to take a lot of energy for him to do and he meandered over to the next table, pulling up his pants again. Tom and I look at each with huge grins and dig into the bags. They’re full of noise makers, hats and candy. 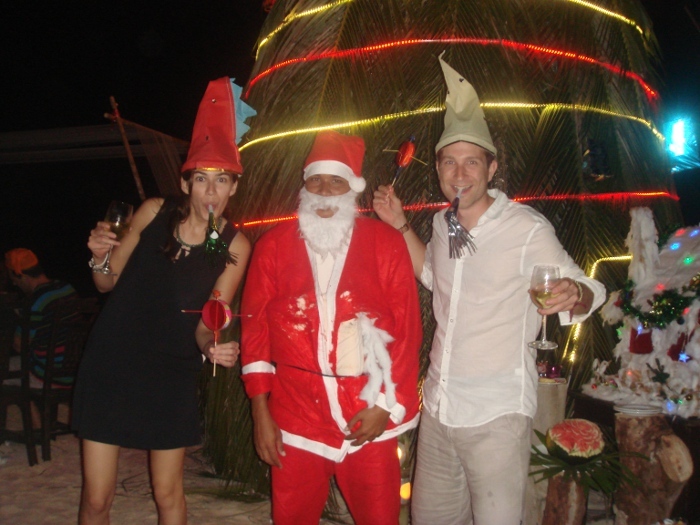 “So apparently Christmas is celebrated like New Year’s in Thailand,” I ask as I plop the pointed red hat on my head. Celebrating Christmas in Thailand with noisemakers. It felt a lot like New Year's Eve. It took all of five minutes for the beach to be turned into a loud celebration of jangling and jingling from all the noise makers. In lieu of all this fun from the gifts, Tom and I decide we must find Santa and have our picture with him. We find him by the Christmas tree. “Santa!” we both exclaim at the poor man who was probably wondering how managed to be roped into this craziness. But he obliged our request and we got our picture with our Thai Santa Claus. Hi NickCole, sorry I wasn’t able to reply to your comment sooner. I’m not sure what the official name is. Hope your daughter’s presentation went well!